Who is NXT? NXT tool NXT case example Why NXT? NXT as a team consists of five strategic designers: Renata Renema, Imke van der Linden, Dewi Wesselman, Evan Al-Shorachi and Lisette Koppelman.We all are master students from the master Strategic Product Design at the faculty Industrial Design Engineering at the Technical University of Delft. Though we do not all have the same background when it comes to bachelor degree and interests. One teammate did a bachelor in Architecture, while the rest did their bachelor in Industrial Design Engineering, all in Delft. Furthermore a few of us went abroad for their minor, but how can we translate this in our consultancy? What are the specialties of our group that differentiates us from the others consultancies? For our strategic design consultancy we will focus on these specific specialties and capabilities in order to stand out: communication, architecture/interior, materialization and retail. Figure 1: Our why/how/what approach is based on Sinek’s golden circle (Sinek, 2011) (click on the picture to enlarge). All of us are focused on what is happening now and what can happen in the future. The ‘future’ has a very broad meaning when it comes to time. The future is tomorrow, the future is next year. We will look at the steps for a company to make that count and make them part of their future. We take a look, together with medium enterprises (companies with 50-250 employees), to the NXT step to take and that is why we call ourselves NXT; the nearest after the present (see figure 1, Why). We want to enable companies to gain long-term competitive advantage by stimulating viable and feasible innovations. For medium enterprises who have a set equilibrium but realize that innovation is necessary to grow and maintain or improve their current position. The companies will need to have a drive to go beyond set borders and want to innovate in the nearest present. We will provide them a tool in a box of the near future to develop a method which allows them to keep on innovating and stimulate this innovation. It will encourage them to take a risk and feel secure about the steps to take. We want to enable companies to gain long-term competitive advantage by stimulating viable and feasible innovations. For medium enterprises who have a set equilibrium but realize that innovation is necessary to grow and maintain or improve their current position. The companies will need to have a drive to go beyond set borders and want to innovate in the nearest present. We will provide them a tool in a box of the near future to develop a method which allows them to keep on innovating and stimulate this innovation. It will encourage them to take a risk and feel secure about the steps to take (see figure 1, How). After the session in the box of the near future we set them free and it is up to them to go out of the box and apply the innovation method that was being taught in the box. This will be the essential step for the medium enterprises to make and be part of the NXT step; the nearest after the present (see figure 1, What). We believe design is about making tangible and/or explicit, mental processes in the field of strategy, ideas and solutions. This includes solving problems and satisfy needs with the focus on purpose and human centered design. A preferable situation is created for and together with the client. The process NXT will go through consists of three phases. An overview can be seen in figure 2. During the first phase – inspiring – we will start with letting the employees thinking out of the box. We will do so by using an ice break activity. In second phase we step into with the employees – synthesizing – we will learn the participants more about co-creation and explain them how to implement this in their current processes. Finally, we expect the company to implement the new method in their office (see Figure 3). Figure 2: NXT process explained (click on the picture to enlarge). Figure 3: Inspiration phase (click on the picture to enlarge). 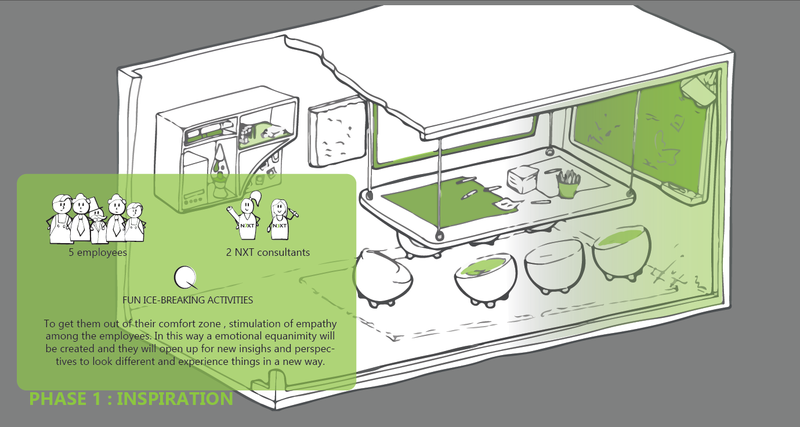 The first step is to get the employees out of the office and let them think out of the box in our box of the future (see figure 3). 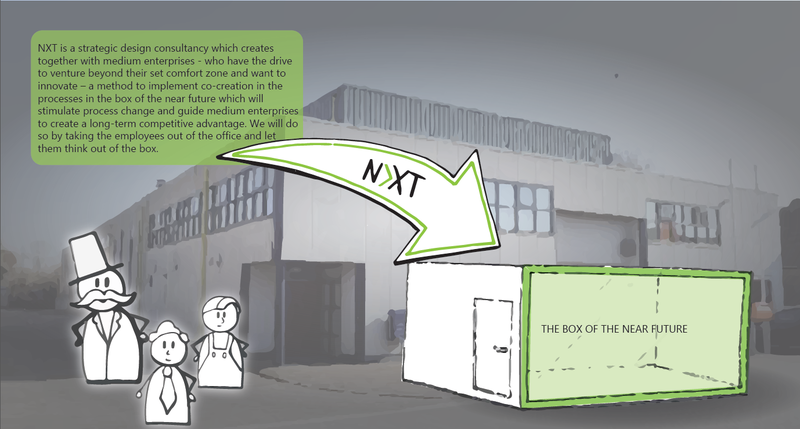 NXT goes to the company with the box of the near future and put this one on the parking area in front of the office. Five employees, who represents together the different departments, will meet in the box with two members of NXT. In this phase the participants will be pulled out of their comfort zone by ice breaking activities. Out of the top ten ice breaker activities we chose for a ‘fun and funny ice breaker’ to start the session (Heathfield, d.u.a). Heathfield (d.u.b) created a list of possible questions that could be asked as funny ice breaker, out of this list we will ask the participants to answer on “Share your favorite material object that you already own” (Heathfield, d.u.b). In this way their egocentric bias (Liedtka, 2014) will be prevented and empathy among the employee will be stimulated. In this way a emotional equanimity will be created among the participants which is needed during the session (Callabretta et. al, 2004). Besides this they will be stimulated to open up for new insighs and perspectives to look different and experience things in a new way. Within the box the new mindset will be created by giving new experiences in hearing, toughing, seeing and smelling. For seeing, the environment will be discussed from the past 5 years and the coming 5 years (the nearest after the present). In this way projection bias will be prevented (Liedtka, 2014). Figure 4: Tool development phase (click on the picture to enlarge). We will learn the participants more about co-creation after the ice braking activity in this phase. For doing so, we make use of the learn-look-ask-try framework from IDEO (Marsden, 2013), but changed the order of the steps. First, we, as NXT, wants to get a feeling about how the employees work together. We will ask the employees to tell us a day in the life at the company and map out this day on post-its for all the employees (see figure 4). Together we will discuss the different working processes of all the members, and since these are on post-its we can play with it. During the second step we will reflect on the processes the employees explained us and learn them about things that go well and wrong. Then, we will ask, the employees how they think the process can be changed in a way they make more use of co-creation. As a last step the employees will get a case during which they can try to work as a team focused on co-creation. Different tools and techniques mentioned by Sanders, Brandt and Binder (2010) will be used in the Box; these tools will help the creative, collaborative process. Figure 5: Implementation phase (click on the picture to enlarge). In the end we, as NXT, want to implement the created strategy into the business. Then, all the employees that took part of the session in the box of the future will go back to their offices and give a presentation for their department to inform the other employees about how co-creation can be incorporated in their department (figure 5). The company can take over the container or can decide to implement all the content in an office that they make available for it. If they do so, they can be inspired and inspire each other inside their own building. Figure 6: The box of the near future (click on the picture to enlarge). 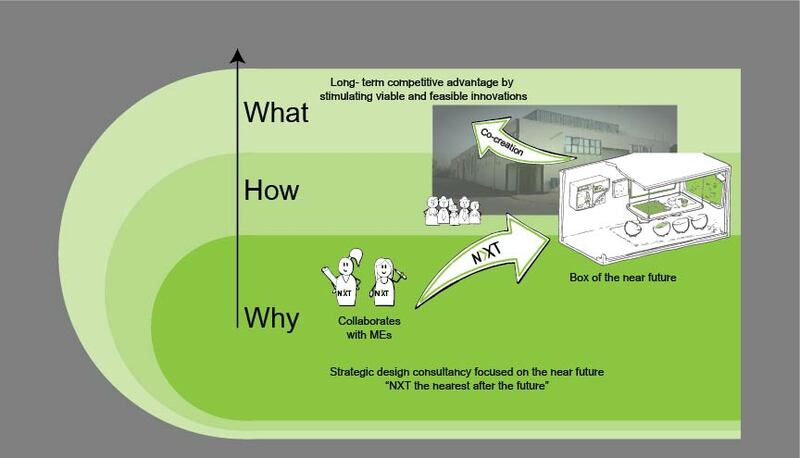 The Box of the near future can be seen as a metaphor for taking people out of their comfort zone when entering the box (see figure 6); this should inspire them to start thinking about a way to change or rejuvenate the company’s innovation process in a design “out of the box” way. Within the box everybody is forced to let go their daily routines and generate ideas from a different perspective then you would do normally; this allows possibilities to go beyond set borders. The idea of the box is to trigger intuitive decision making and risk taking. We see the box of the near future as a medium and work with this as starting point instead of working towards a goal (Sarasvathy, 2008). Verganti (2009) explains in his book the added value of design-drive innovation. If applied in the right way, an organization can create products that are strong and have a unique personality that differentiate from competing companies. By thinking out of the box during the session, unique product ideas can be thought of that change the innovation process. An organization can boosts the company’s sales volume by having a direct connection with the brand (brand equity) by designing meaningful and functional products the user experience will be positively influenced. This is also a focus point during the session. Creating new archetypes of meaning and language which creates customer loyalty. The first who has early asses to key resources and invests in a innovation is able to create a strong network position. By interpreting trends and developments at the right time a company can be the first who learns from its investments. This knowledge can be used in a later stream of incremental innovations. In this way the box will create added value towards the company. Within the box playful and particionary events should happen but with results that should be measurable in the end in terms of competed experiments in an controlled environment. Figure 7: The Grass case (click on the picture to enlarge). 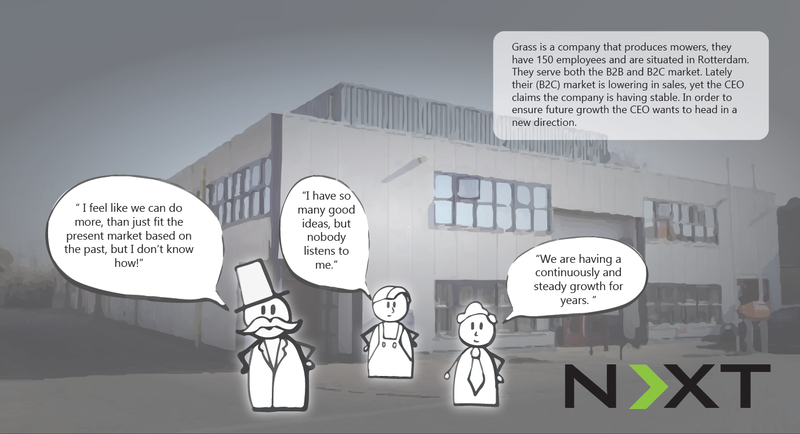 Grass is a company that produces mowers, they have 150 employees and are situated in Rotterdam (see Figure 7). They serve both the B2B and B2C market. Lately their (B2C) market is lowering in sales, yet the CEO claims the company is having stable. In order to ensure future growth the CEO wants to head in a new direction. Some employees are not motivated anymore because of the chosen course in the last years. They claim the higher management does not consider their input; they would like to see co-operation between different departments. Their CEO received lately a flyer from NXT, a new strategic design consultancy, who introduce themselves via the flyer. The CEO is willing to change the current course of the company, but he does not know how this can be done. He contacts NXT and make an appointment; two weeks later NXT arrives at the company’s parking spot with a container, the box of the near future. The first step is to get the employees out of their companies and let them think out of the box in the box of the future. Five employees are chosen to take part of the session with NXT. They represent the different departments: R&D, marketing, production, executive board (CEO) and logistics. They will enter the box, together with two NXT members. The first thing NXT does is asking the five employees to give an answer on the following question: share your favorite material object that you already own. The participants have some trouble with answering the question at start; the CEO takes the lead and answers the question, the others follow his example. In the late morning the participants will be asked to explain what a day in their life at the company looks like. This will be mapped on several post-its which will be put on the wall. After that the different processes will be discussed and reflected upon. During the next step the participants will be asked to explain how the processes can be changed in order to facilitate co-creation. The final solution will be mapped and all participants will be asked what they think of the final solutions; some small tweaks will be made when needed. The session will end in the late afternoon and a small gathering with all the employees will be held together with some drinks. The five employees who participated will share their experience with others. The next day each of the participants will give a presentation about the findings of the previous day to their department. They will also try to introduce the new way of working by making use of co-creation. The participants were so excited about the container they would want to bring the content of the container inside their building. They decide to buy the content and put it in a room, so they do these sessions with their employees. NXT is asked to help them to create their own method of holding a session. 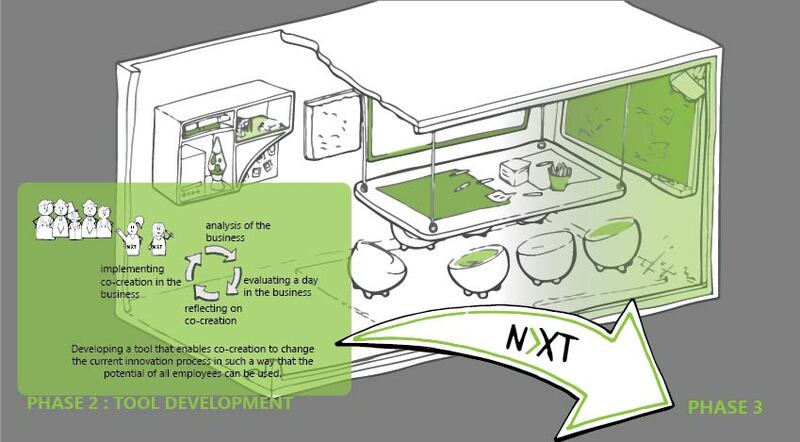 NXT as a strategic design consultancy wants to help medium enterprises (50-250 employees) who have the drive to venture beyond their set comfort zone and want to innovate. Two teammembers of NXT will do a session of a day together with five employees of the company. The session will be held in the box of the near future, placed in front of the office. 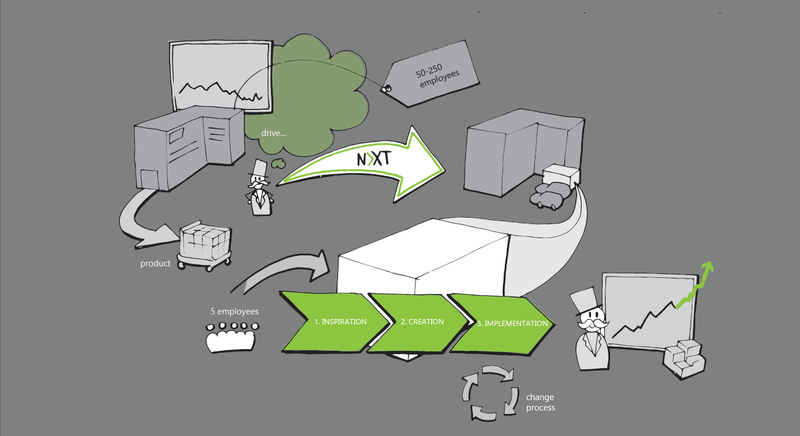 NXT will create together with the employees a method to implement co-creation in the processes. This will stimulate process change and guide medium enterprises to create a long-term competitive advantage. The process in the box of the near future consists of three phases and will in the end lead to the implementation of co-creation the working process of the company. The three phases are: inspiring, synthesizing and implementing.In the end we want the company to bring the content of the box into their office or keep the box on the parking place in front of the office. With our method we do not want to only focus on radical innovation but also on incremental since most of the good innovation are incremental. We want the companies to improve their innovation process more co-creation focused. 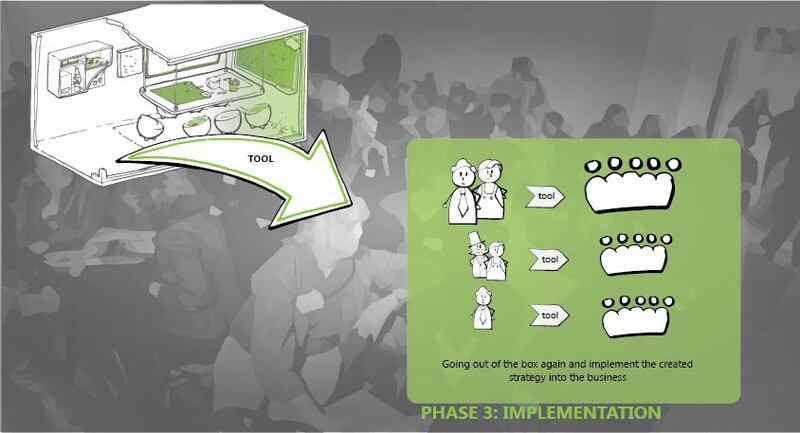 The Box of the future can be seen as a tool from which the outcome is not totally defined at the start of a workshop. This makes it a bit harder for us to communicate the added value of the tool towards companies. That is why it is important for ourselves to know our added value towards companies and how this can be usefull in many different situations. At this moment we have decided to send flyers towards companies to convince our added value towards them and to gain knowledge. Another discussion point of our box has to deal with the time we are in contact with an organization. A session will take one day (Binder and Brandt, 2008), so we are not able to know a companies into detail, this has some advantages but also disadvantages. In this way we can take them employees really out of the box, but we should be aware that ideas should be realistic implemented into the company. Binder, T., & Brandt, E. (2008). The Design: Lab as platform in participatory design research. Co-Design, 4(2), 115-129. Liedtka, J. (2014). “Perspective: Linking Design Thinking with Innovation Outcomes through Cognitive Bias Reduction”. Journal of Product Innovation Management, (forthcoming). Sanders, E. B. N., Brandt, E., & Binder, T. (2010, November). A framework for organizing the tools and techniques of participatory design. In Proceedings of the 11th biennial participatory design conference (pp. 195-198). ACM. Sarasvathy, S.D. (2008). Understanding effectuation: Problem space and solution principles (Ch. 4). In: Effectuation: Elements of entrepreneurial expertise. Cheltenham (UK): Edward Elgar. Sinek, S, (2011). Start with why: how great leaders inspire everyone to take action. London: Penguin Books.